VidaMia - Pantera Negra in black suede with red trim and red soles. Vida Mia is a fantastic line of superb hand made tango shoes. Slightly more expensive then some of our other shoes, but for the quality and features they are definitely worth it. Each pair of shoes have a 4mm thick (a little over 1/8 inch) special shock-absorbing cushioning beneath your foot, which make them the most comfortable shoes you have ever tangod on. And the padding does not collapse after a few times, but continues with its great cushioning qualities even after hundreds of wears, so you will continue to feel like you are dancing on a cloud as long as you have the shoes. Do not confuse this cushioning with 'extra padding' offered by other manufacturers, it is completely different. Your feet will definitely feel the difference. 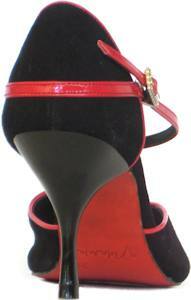 The shoes are made from black suede with red trim and red soles. The inner lining of the shoe is made from super-soft goatskin. Every small detail is considered in the design, right down to the beautiful crystal buckles. Comes in 2 1/2 inch (6.5 cm) heels and come with either suede or leather soles, and with a choice of buckle around the ankle.